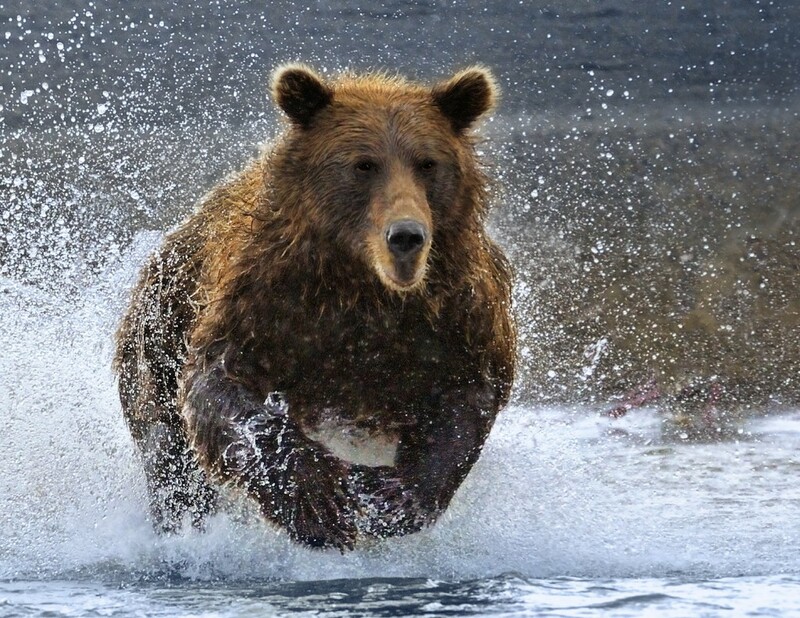 “The Alaskan coastal brown bear is the second largest land predator in the world. Only the polar bear is larger. The bear’s rich diet helps them grow to sizes of over a thousand pounds and up to nine feet in height. The key part of this diet is Alaska’s abundant salmon population. In the late summer the salmon spawn in the shallow rivers and streams along the coast of the Cook Inlet. With winter not far away the bears take this opportunity to bulk-up for their winter hibernation and spend most of their days chasing down salmon. I’ve spent many hours photographing these huge predators race across the shallow streams and lunge into the water to catch a salmon. I’ve watched some of these bears catch a twenty pound fish, stand-up with the fish in their paws and devour it whole, in a matter of seconds. Its an amazing experience to watch these huge predators up close and in action.